Hons Fine Art, Central St Martins, London), both practicing artists. We are reaching out to those of you who has put by the wayside your charcoal..
A HELLO to the man at the back hiding in fear of his tonally devoid torsos! 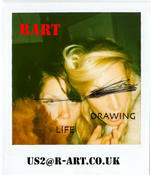 Come Join RART for a LIfe DRAWING session with a difference.. These classes are for all, we caterer to the ability of every participant the Tutors conducting these sessions have worked across distinguished Art institutions and will embrace everybody's talents and help tackle any fears!!!!! A critique and RANT shall proceed the drawing sessions within the ambient setting of the Pennethorne.